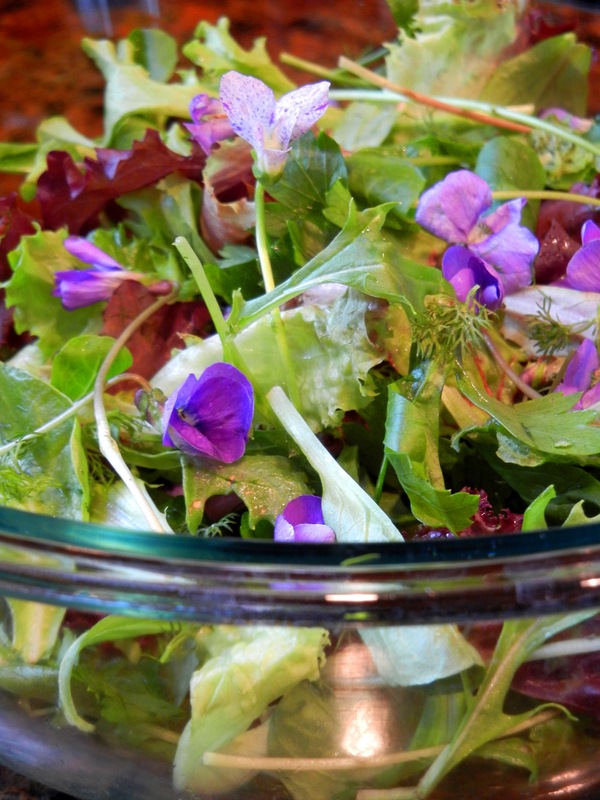 It’s early Spring, and there is an abundance of all sorts of young herbs, lettuces, and edible flowers. They are tender, beautiful and delicious. This is clearly the beginning of salad season. Just pick, tear, and drizzle with the best possible olive oil. Tonight I used dill, mint, picked thyme, parsley, baby lettuces and, as the pièce de résistance, purple and white violet flowers. It’s late April here in Ohio and in my backyard, I have a crab apple tree* in near-full bloom. In my front yard, I have a magnolia tree in near-full bloom. I have grape hyacinths popping up under the forsythia. 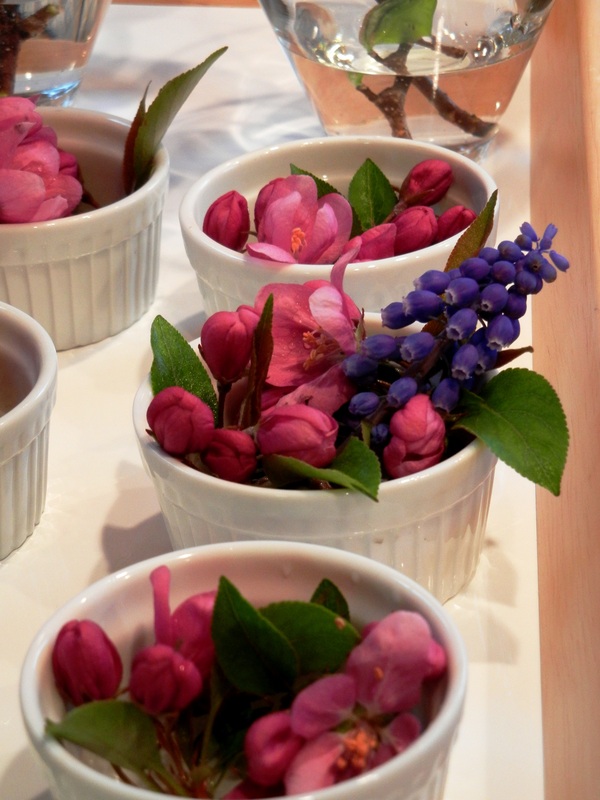 Using my prep bowls, I nestled sprigs of crab apple and hyacinth for personal arrangements on the dinner table. 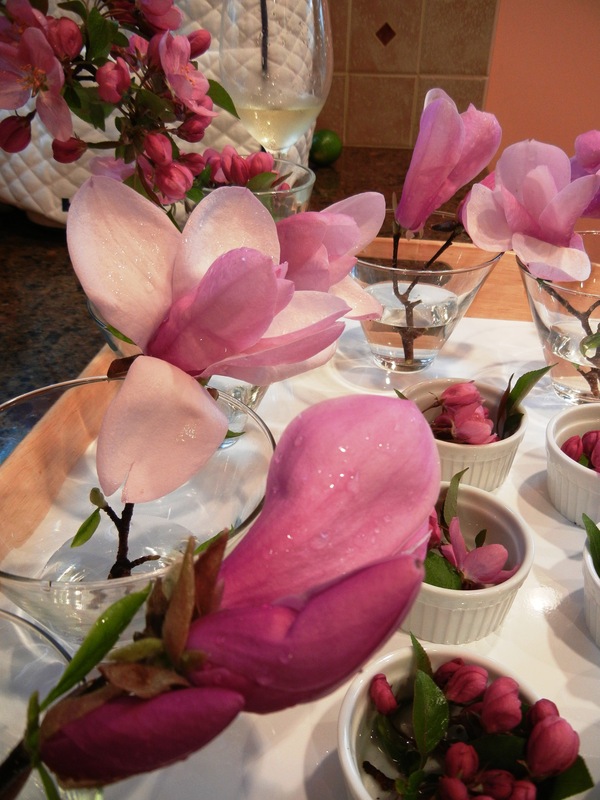 In stemless martini glasses I cut short stems of magnolias to march down the center of the table. 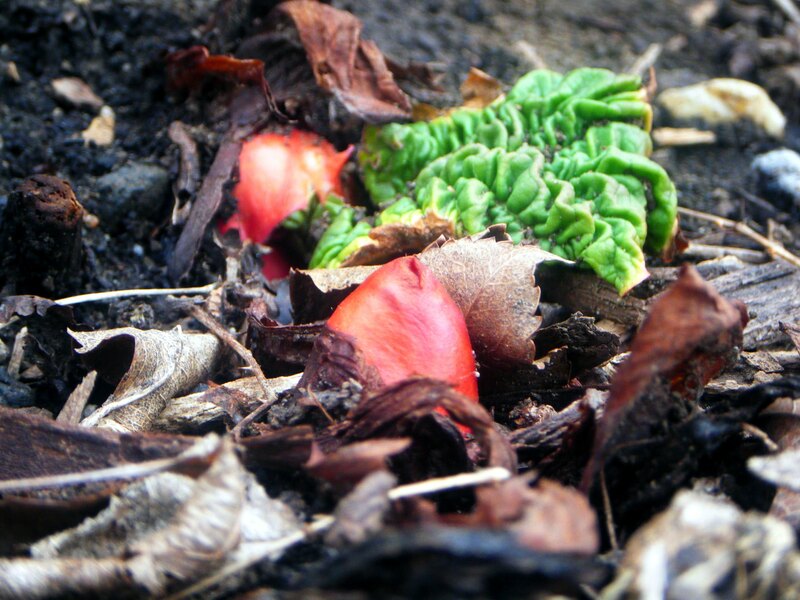 Playing in the backyard with Cherub this afternoon, I couldn’t help but admire the rhubarb plant that’s seriously taken off. I’ve watched it daily from my kitchen window, but from that vantage point, I had no idea just how much was ready for harvesting. Cherub and I picked four large stalks (for a total of about 3/4 of a pound) this afternoon. There must be another 40, at least. 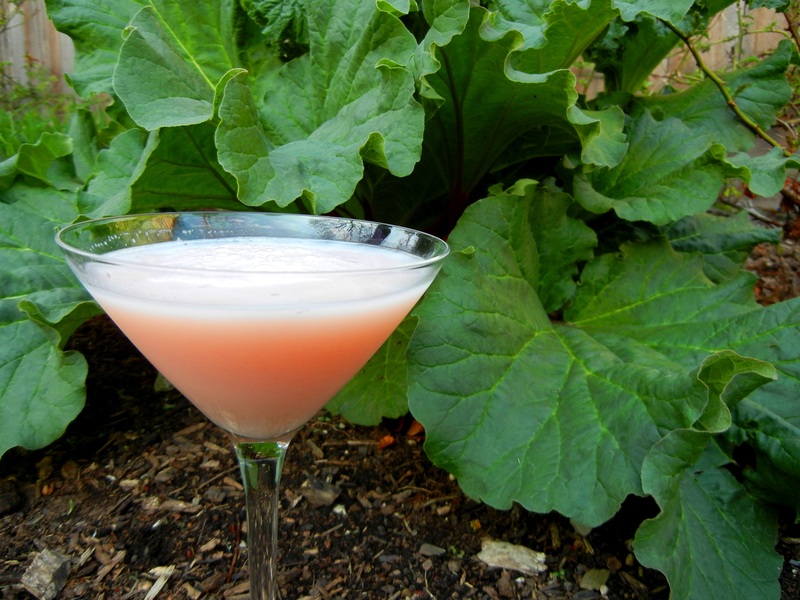 My favorite way to use rhubarb is in cocktails. I simmered the rhubarb down to a syrup (straining and reserving the remaining pulp for a dessert to be determined). It’s a perfect early-spring combination of rhubarb, orange, vanilla and vodka. It’s creamy, tart and appropriate for any get together. I thank Jamie Oliver for the original inspiration, but cheekily name this version after Kate who will be bidding farewell to her “common” life. And if you’re NFI, this cocktail might be the perfect thing to toast the newly married couple. Simmer together over medium low heat for eight to ten minutes or until it becomes a pulp. Strain, reserving the solids for another purpose if desired. Allow syrup to cool. Playlist included Common People, by Pulp. When it was just a wee sprout a few weeks ago.The four stalks harvested this afternoon. This is a joyous way to start a meal. 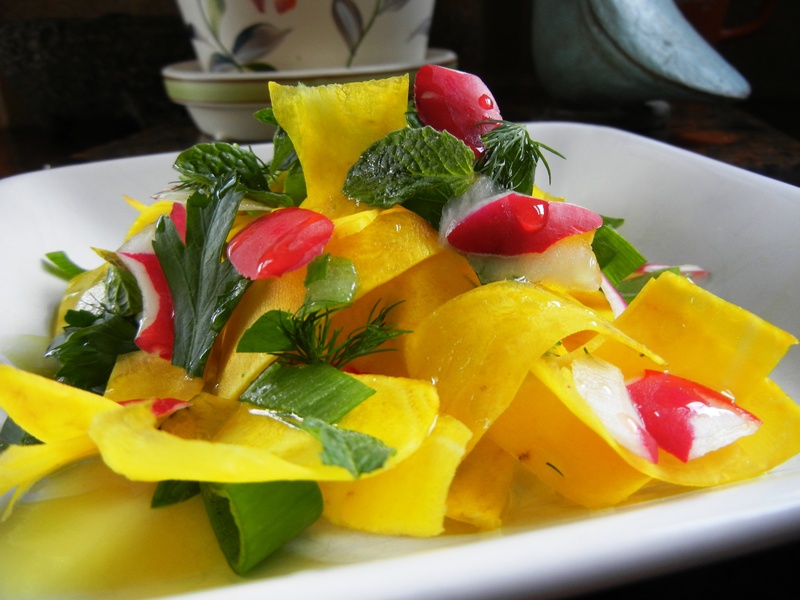 It’s a beautiful salad, with ribbons of fresh golden beetroot, bold red radishes, freshly picked mint, and wild and aromatic dill. There’s an Eastern European soul in there, but those delicious and time-honored ingredients take on a brighter, more modern tone. It’s very simple and unfussy to prepare, and it made me very happy to eat it. All that’s left to be said is that it was inspired by a Michael Symon recipe in Vefa’s Kitchen. Yes, that’s the Bible of Greek cooking. No, borders don’t mean a whole lot when it comes to food. As with any salad, there aren’t too many rules. Peel the woody exterior off of 2 smallish golden beets. No need to even cook them! Then just shred them into ribbons using your peeler. When the piece you’re holding becomes small enough, eat it. Do the same with 2 largish radishes. 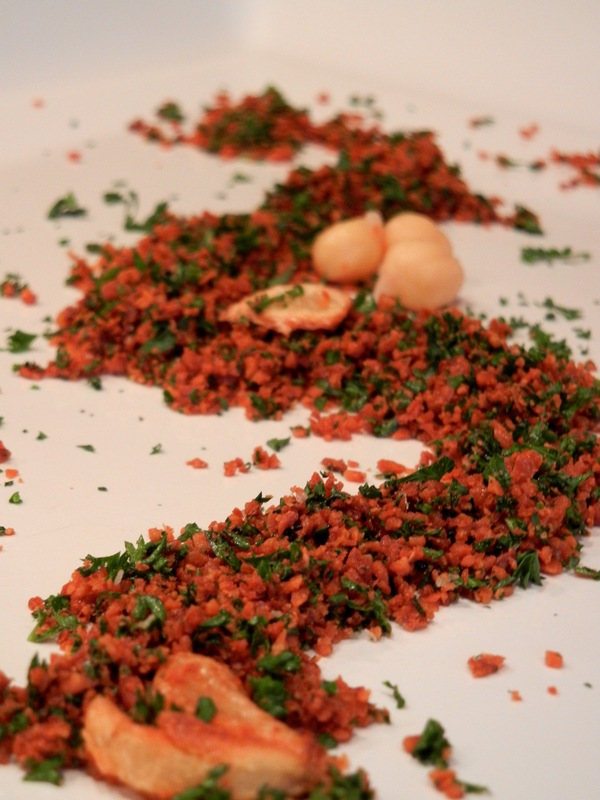 Then add your herbs: tear mint, parsley and dill roughly and in the proportion of your choosing. Finally, make a simple dressing. I would suggest 4 T of olive oil, 1 T of apple cider vinegar, 1 T of good mustard, a drizzle of honey or a pinch of sugar, and salt and pepper to taste. Mix the dressing into the veg and herbs to coat evenly. Enjoy as a starter or a light lunch. Playlist included For What It’s Worth, by the Cardigans. I’m always honored and humbled to cook food with such proud, venerable, even ancient roots. Korean food is no exception. Thousands of years of refinement has led to a breathtaking marriage of flavors. 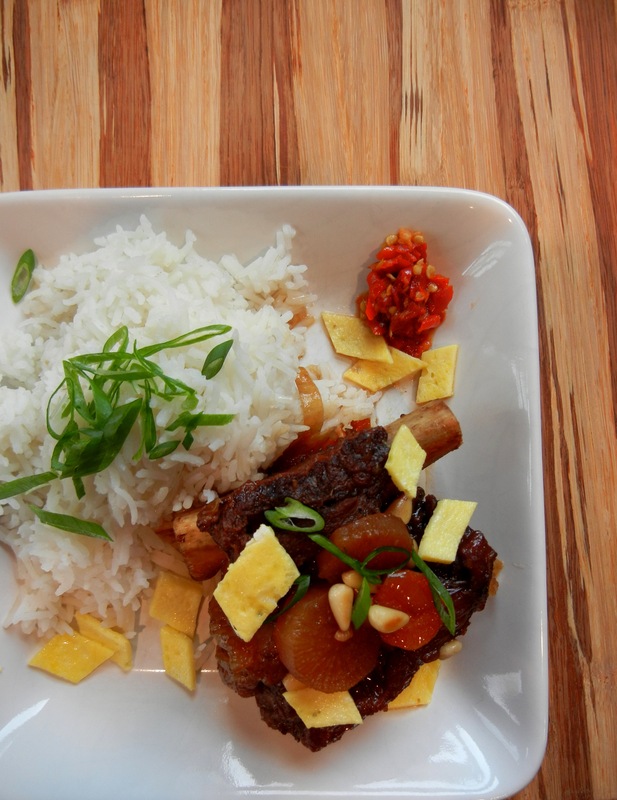 This dish is a perfect example. The sweet of the mirin joins the depth of the soy and the earthiness of the mushrooms for a bit of kitchen alchemy. I compulsively tasted it as it simmered away, and I struggled to remember a more delicious sauce. It was beautiful. Again, its a recipe that takes a while, but there’s not a lot of hands-on time. There are some moving parts at the end, but it is so – I repeat – so worth it. It’s comforting, traditional, and special. Those eating with you will feel loved. It’s been so rainy today that everything in sight is a variation of green: the yet-to-be-mowed grass. The budding trees. The trembling stalks supporting the heavy heads of daffodils. My dinner of orecchiette bathed in butter, chartreuse leeks, backyard mint and verdant parsley. 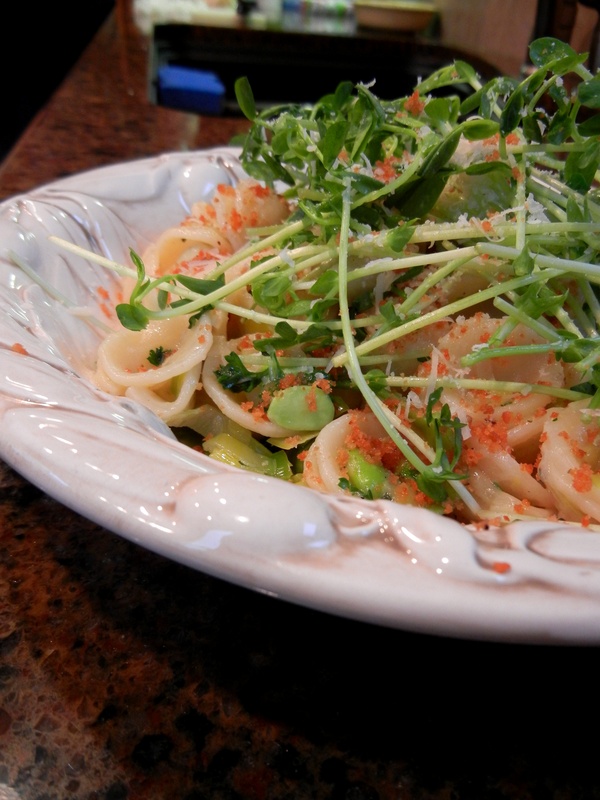 Tiny pasta ears cradle pale green edamame, the whole bowl crowned with pea shoots. It was as close to a taste of spring in a bowl as I’ve come in a long time. It is long overdue.